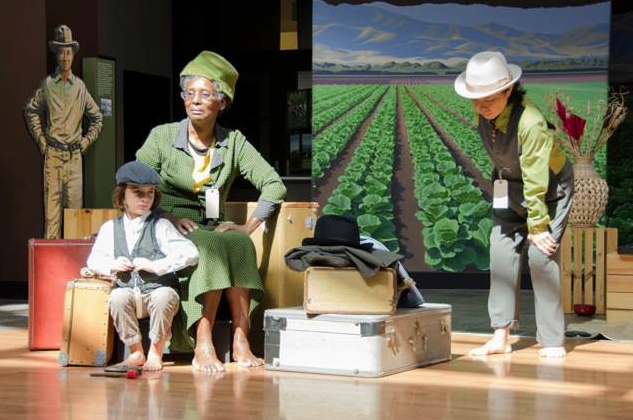 “When Dreams Are Interrupted” has been performed at different venues, telling the story of Japanese American communities in the Bay Area and also including the story of Filipino Americans at the National Steinbeck Center in Salinas last year (pictured). “When Dreams Are Interrupted,” is a riveting site-specific performance that uncovers the profound imprint left on a neighborhood by the forced removal and mass evacuation of Japanese American communities in 1942. Purple Moon Dance Project’s Jill Togawa, Arisika Razak, Ruth Ichinaga, and Sharon Sato explore and infuse with “The Tag Project” to draw out the stories and memories amassed by Maruyama and to highlight local history and stories, both known and newly uncovered. Presented by Contemporary Asian Theater Scene, Japanese American Museum of San Jose, Purple Moon Dance Project and San Jose ICA. A special remembrance will be held in honor of Memorial Day. Seating is limited. The closing event is free and open to the public, but donations are welcome. To RSVP, call (408) 283-8155. For more information, contact Jill Shiraki at [email protected] or visit www.sjica.org.